BANGI, 2 July 2014 – Wintergreen oil, a herbal extract that contains compounds used to make Asprin, has been found to be a safer and cleaner replacement for the solvent Xylene for people who work in medical or biological laboratories preparing and mounting samples on slides. A group of final year medical students of The National University of Malaysia (UKM) had recommended using wintergreen oil after they found it to be safer and more environmental-friendly than Xylene in a research done at the Department of Parasitology, Faculty of Medicine. The lead researcher Koay Jiah Bou said the common practice was for students and laboratory staff to use xylene as a clearing agent when mounting mosquito or other insect egg samples onto slides for permanent record. 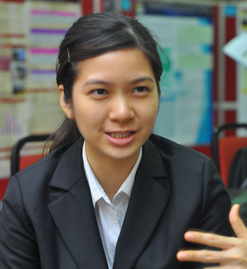 Speaking to the UKM News Portal at the Medical Undergraduates Annual Scientific Research Meeting (MUASRM) 2014 in Kuala Lumpur last month, Koay said not only did the students’ analysis show that wintergreen oil was less hazardous to people, it also preserved the specimens in the slides better than xylene. Xylene, an aromatic hydrocarbon, is used as a solvent in chemical applications or cleaning organic samples for preservation. It is also toxic when inhaled and corrosive to the skin of the people who use it when mounting the specimens on to slides. It is used in the laboratory to make baths with dry ice to cool reaction vessels and as a solvent to remove synthetic immersion oil from the microscope objective in light microscopy. In histology, xylene is the most widely used clearing agent. Xylene is used to remove paraffin from dried microscope slides prior to staining. After staining, microscope slides are put in xylene prior to mounting with a coverslip. However Koay said a comparison between xylene and wintergreen oil showed there was less shrinkage of the mounted specimens in the slides using wintergreen oil. Thus the maggot or other insect egg specimen can retain their original size better with wintergreen oil . More importantly for the students and researchers working in the laboratories, wintergreen oil is not carcinogenic and corrosive like xylene. Furthermore wintergreen oil can be more easily and safely disposed to the environment compared to xylene. Koay and the other student researchers were very well aware of the healing properties of wintergreen oil. Wintergreen oil is an extract from wintergreen leaf that contains an aspirin-like chemical that can reduce pain, swelling, and fever. Aspirin is used to treat mild to moderate pain and to reduce fever or inflammation. The Wintergreen plant is a herb and its oil is made by steam processing of warmed, water-soaked wintergreen leaves. The leaves and oil are used to make medicine. Wintergreen leaf is used for relief of painful conditions including headache, nerve pain (particularly sciatica), arthritis, ovarian pain and menstrual cramps. It is also used for digestion problems including stomach ache and gas (flatulence); lung conditions including asthma and pleurisy; pain and swelling (inflammation); fever and kidney problems. Some people use small doses of wintergreen oil to increase stomach juices and improve digestion. Wintergreen leaf is sometimes applied directly to the skin as a wash for achy joints (rheumatism), sore muscles and lower back pain.